I happened to be watching my new favorite show, Bravo’s Million Dollar Decorators, last week and noticed a very familiar name. The show, which follows five LA-based, high-end interior designers in their industry, prominently featured One Kings Lane, the Kleiner Perkins and Greylock-backed flash sales site for home décor, furnishings and accessories. 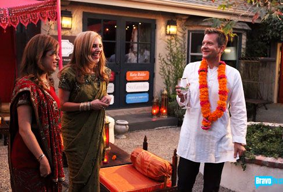 In an episode that aired a few weeks ago, One Kings Lane was co-hosting a party with one of the decorators, Nathan Turner, to celebrate a new curated sale from Turner featuring hand-picked furniture and accessories from India. The site actually got a ton of air time, and even featured co-founder Susan Feldman (pictured in the post with Turner). The Turner-curated sale on One Kings Lane (which featured the Bravo endorsement) started the following morning after the episode aired and One Kings Lane saw most items sold out within minutes. This past week’s episode again featured One Kings Lane as part of the story line, with celebrity designer Martyn Lawrence Bullard accompanying Feldman and another One Kings Lane employee to London to pick out items for a similar curated sale. One Kings Lane got much more air time in this past episode, and when the sale hit the next morning, the event was 96 percent sold out 3 hours into the start of the Bullard-London sale. And Wednesday was all time high for daily new member acquisitions, thanks to the feature on the show. A Bravo endorsement is a big deal for the flash sales site, considering the channel is seeing record viewership among adults ages 18 to 49. Feldman tells us that the site was originally doing a Tastemaker Tag sale with Turner last year, and One Kings Lane actually took a TV crew with them to film the journey in the effort of pitching Bravo with the idea to use the flash sales site in the reality TV show. Upon return, Feldman says Bravo ended promoting the startup in the show because of the strategic fit. Nowadays, broadcast is traditionally not thought of as a “direct action” marketing channel for web startups. But this example with One Kings Lane and Bravo (who has also featured partnerships with Foursquare and Shazam) demonstrates the power of connecting broadcast to next generation commerce, such as the flash sales model. One Kings Lane has proven that a niche commerce model can not only draw a large userbase (the company is nearing 2 million users, says Feldman), but see revenue growth as well. The startup grew revenue over 500 percent from 2009 to 2010. In this Wall Street Journal interview, One Kings Lane CEO Doug Mack says that he expects to continue this growth (by “hundreds of percent”) this year as well. And more than 75 percent of sales come from repeat customers (I happen to fall into this category). The truth of the matter is that commerce is evolving and promotional deals with networks, technology companies and other content providers is just one way in which flash sales sites are innovating. Gilt has been combining editorial with commerce in its foodie site Gilt Taste as well as in its Home And Furniture vertical. And Gilt just launched an interesting deal with in-flight WiFi company Gogo Wireless to offer exclusive in-air deals and free access on the flash sales site. Celebrity partnerships are another way that flash sales sites are trying to draw business and engage with users. One Kings Lane featured a deal with actress Gwyneth Paltrow to promote her new cookbook and held and event in New York in her honor as well. Gilt and Lady Gaga teamed up for a curates dale featuring Gaga-inspired merchandise, access to Gaga events and more.